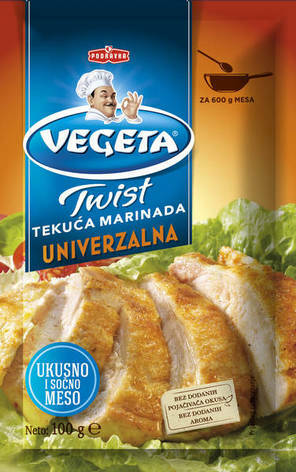 Vegeta marinade Universal is a tiny detail that makes the huge difference between a good and fantastic meal. Ideal for all kinds of meat and vegetables, it will add the familiar flavour to roasted or grilled meat, and also can be used as a seasoning for goulash, paprikash and vegetable stews. Contains no flavour enhancers and artificial aromas. A bag content is sufficient for 600 g of meat. Usage: 1. Shake well before opening! 2. Pour the marinade over meat or fish. 3. Marinate for 30 minutes or longer – to get a stronger taste. 4. Roast on a barbeque, in a pan or in the oven. Water, vinegar, sunflower oil, table salt, dried onion, sugar, dried carrots, concentrated pineapple juice, spices, dried celery, dried garlic, corn starch, color (paprika extract), dried parsley, preservative (potassium sorbate), thickener (xanthan gum), antioxidant (rosemary extract) contains dried celery.